Reading and share top 5 famous quotes and sayings about French Cooking by famous authors and people. 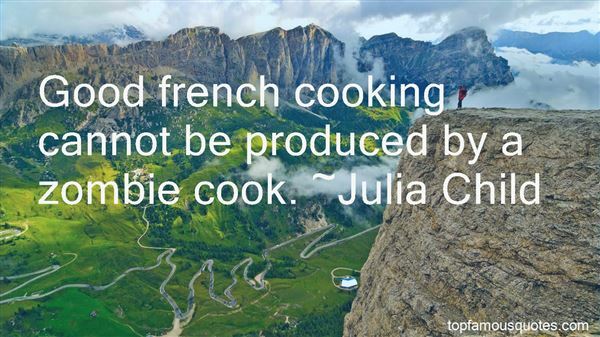 Browse top 5 famous quotes and sayings about French Cooking by most favorite authors. 1. "I went to L'Academie de Cuisine in Gaithersburg, Maryland, and I think French cooking is the basis for a lot of classical cuisine, a foundation of a lot of other cuisines. That said, it's not the only way to approach a cooking career." 2. 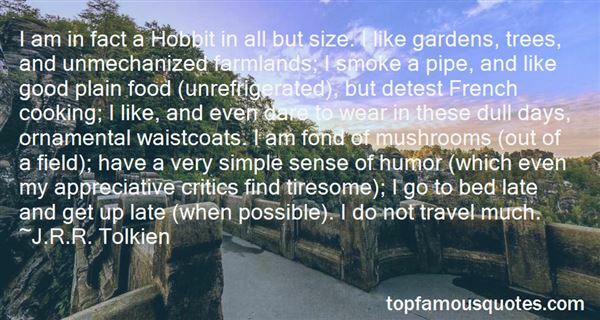 "I am in fact a Hobbit in all but size. I like gardens, trees, and unmechanized farmlands; I smoke a pipe, and like good plain food (unrefrigerated), but detest French cooking; I like, and even dare to wear in these dull days, ornamental waistcoats. I am fond of mushrooms (out of a field); have a very simple sense of humor (which even my appreciative critics find tiresome); I go to bed late and get up late (when possible). I do not travel much." 3. "Good french cooking cannot be produced by a zombie cook." 4. 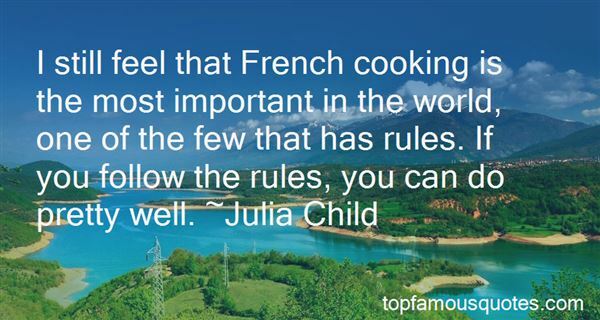 "I still feel that French cooking is the most important in the world, one of the few that has rules. If you follow the rules, you can do pretty well." 5. "I grew up in France, my first language was French, and I tend to gravitate towards French cooking." How do you kill something that's already dead?Nobody knows enough about them. Ask Jason. He'll have an opinion.Wait a moment. Rachel could see Corinne talking to Jason, but they were too far ahead to hear. He says you chop them up into little pieces.But what if that infects you with the disease?Jason leaned closer to answer Corinne quietly. She laughed. You let Nollin do it."